Apple Tree Cottage01263 715779work01603 870304fax Self-cateringThis pretty wisteria-clad cottage sits at the heart of the ancient village of Saxlingham Nethergate and yet is just a few miles from the bustling city of Norwich. Grade 11 listed and in parts dating back to the 15th Century, the owners have created a beautiful and characterful cottage. There is a bedroom on both the ground and first floor and unusually for a cottage, the impressively beamed and vaulted sitting room is also on the first floor. With a Rayburn in the kitchen, elegant furnishings and decor, this delightful cottage is the perfect spot to relax in. The village itself is in a Conservation Area, there are some lovely walks and bike rides on the doorstep and some excellent restaurants nearby. Also within easy reach is an 18 hole golf course and carp and coarse fishing lakes. • Other: Towels. Travel cot, Books and games provided. Travel Cot - please request on booking. • Outdoors: Pretty garden area with seating and to the rear is a fully enclosed courtyard with patio table and chairs, barbeque and the facility for secure bicycle storage. Apple Tree Cottage offers weekly bookings starting on Friday. Apple Tree Cott offers weekly bookings starting on Friday. 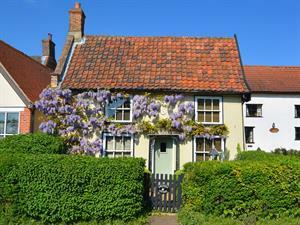 This pretty wisteria-clad cottage sits at the heart of the ancient village of Saxlingham Nethergate and yet is just a few miles from the bustling city of Norwich. Grade 11 listed and in parts dating back to the 15th Century, the owners have created a beautiful and characterful cottage. There is a bedroom on both the ground and first floor and unusually for a cottage, the impressively beamed and vaulted sitting room is also on the first floor. With a Rayburn in the kitchen, elegant furnishings and decor, this delightful cottage is the perfect spot to relax in. The village itself is in a Conservation Area, there are some lovely walks and bike rides on the doorstep and some excellent restaurants nearby. Also within easy reach is an 18 hole golf course and carp and coarse fishing lakes.